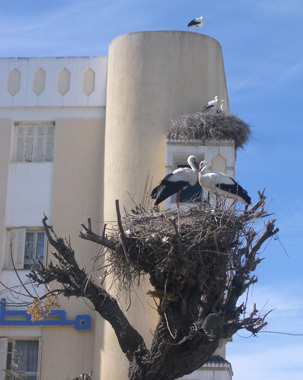 Jendouba: Tunisia must be on the stork fly-way. Before the end of the last Ice Age, Tunisia and other parts of the Sahara were covered by forests and lakes. It was a land with lions, cheetahs, and elephants. Now Tunisia only has 1 permanent river. And despite being among the countries with the most severe water shortage problems in the world, agriculture continues as an important industry. Tunisia is only 93 miles from Sicily, is less than 100 miles wide and is a little over 450 miles long. For a US citizen, Tunisia might as well be an island as it is bounded by the Mediterranean, Libya, and Algeria. One could study all the big players in ancient western history by studying the history of Tunisia as everybody who was anybody was here. 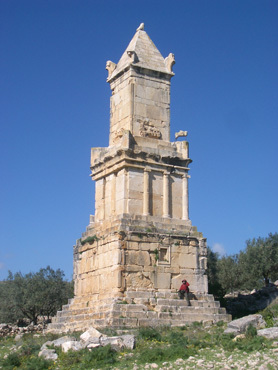 The pinnacle of the the western branch of the Phoenicians was here, in Carthage. The Greeks and Romans were here, as well as the more obscure Numidians from the immediate west. Then came the Vandals and Byzantines. And who would believe that the Vikings made it to Tunisia too, represented by their Norman descendents. The Ottomans also staked out their turf in Tunisia for several centuries. More recently, Luke Skywalker was in southern Tunisia with at least 9 filming locations for Star Wars still available for visiting by enthusiasts. Tunisia won its independence from France in 1956 and is on only its second ruler since then. Officially a democracy, both of its post-colonial leaders have operated the country as a police state in their drive to modernize the society through a policy of secular westernization. Both men viewed Islam as a barrier to progress and as a consequence, freedom of speech continues to be sacrificed for the sake of modernizing. Slow internet with limited bandwidth were the censorship techniques we encountered. 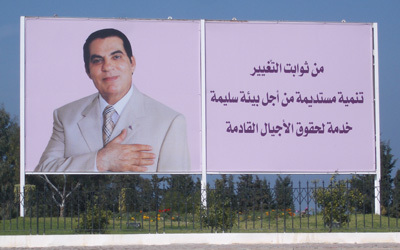 President Ben Ali lightening up his image. Tunisia has about 10 million people, 98% of whom are Muslim and 90% of whom live in Tunis on the northern coast near ancient Carthage. The advanced status of women is unique in the Arab world--and it shows. Tunisia was the first country in the Arab world with a constitution (1861). It works hard to hold the position of a moderate Arab nation, viewing itself as a bridge between the western and Arab worlds. Though they are an emerging nation, they are proud of their relative prosperity and stability compared to their regional neighbors. The Tunisians continue to promote their legacy of religious tolerance though only a Muslim can be president. And as we learned first hand, the Tunisians are a friendly people. Reading intriguing snippets about Tunisia once in the country made us all the more glad we were there. Being in Tunisia was an opportunity to experience our 3rd Muslim country after having been in Turkey twice and Egypt once, it was our second experience in North Africa, and it would give us several encounters with the difficult-to-find remnants of the ancient Phoenicians. It would provide a whopping dose of culture and historical perspective while getting us out of the chill of early spring in the more familiar northern latitudes. 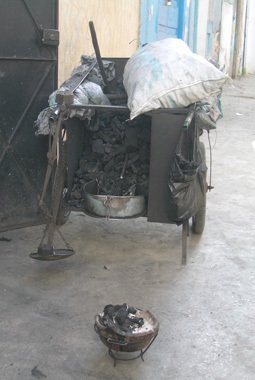 Charcoal burner underfoot in the street. The intense relaxation response triggered in our muscles by a piping hot bath each night in Tunis reminded us that, however interesting, our days were stressful. The dance on the sidewalks in Muslim countries demands constant concentration as there is a prohibition against touching, especially Muslims being touched by infidels or touching between the sexes. The Tunisians were far more relaxed about chance contact than the Egyptians had been but it was still clear that touching was to be avoided. And we had to remember not to touch each other in public. Some 20 and 30 year olds would walk arm in arm on the fashionable promenade, but it was easier for us to stay in the "off limits" mode rather than sorting out where it was OK and where it wasn't OK to touch. Constantly being stared at was a wearing distraction, as was navigating through traffic. The drivers were aggressive on the main streets but their vehicles were reduced to a walking pace as pedestrians filled the side streets because of sidewalks blocked by parked cars or vendor booths. Every step required vigilance to maneuver around dog poop and broken surfaces at the ground level and to compete with the other people and cars for fleeting openings in the congestion. After 6 nights in Tunis we'd explored the medina or old town, we'd spent 2 days examining Carthage ruins, and devoted a day each to the awesome Roman mosaics at the Bardo Museum and getting online via a Tunisian cell phone provider--it was time to head out into the rest of the country. Tunis had taken some adjusting to but now we didn't want to leave; we both found ourselves a little apprehensive at taking the next leap into another layer of the unknown. Despite the newness of the culture and the currency wearing-off and gaining increasing confidence in the goodwill of the people, it seemed too soon for more adventure. We realized that we weren't quite ready to take another dive into even more foreign, more unpredictable situations in the hinterland. And yet being in Tunisia was expected to be our most stimulating adventure of the year so it was best not to hide from it. Our first obstacle of the travel day out of Tunis, which was getting on a bus to the village of Teboursouk near the Dougga archeological site, melted away with the help of fellow tram rider. The woman who was about our age started chatting with us as she wanted to revive her school-era English--she was a staff member at an engineering firm that was now working with American companies. Bright and smiling, she was irresistible to talk with. She gave us her cell number should we need help during our stay and lined up a ride for us to our destination in a passing minibus. We'd expected this step in the progression to take 1-2 hours while we sorted through the ticket stands and we waited for the next bus and suddenly we were settled in our cramped seats and on our way to Teboursouk. Our 2 star hotel, the only lodging option at all close to the Dougga archeological site, did however present us with that extra sense of adventure that we dread. The only light source in our room was a single candelabra-styled bulb obscured by a dark shade. 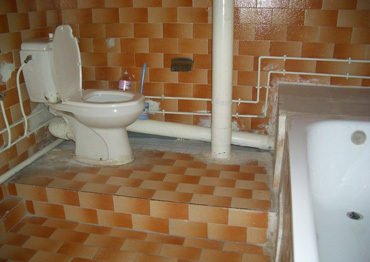 The hot water was OK but wouldn't deliver that tension-relieving heat we enjoyed in our Tunis tub. A look from the hills above Teboursouk. Screening suggestive of a mosquito problem had been put on the single window but it had been slashed opened. We were immediately sympathetic with the slasher as there was no way to open the wooden shutters to let daylight into the dark room with the screening intact. And the wide gaps around the window and door framing had us adding masking tape to our short shopping list for the afternoon as once in the room for the night, we would block the mosquito thoroughfares with tape. We always hope to confine our adventure to the daylight hours but this room would keep the sense of tension high instead of being a safe haven. Fortunately our host town was easy to be in. 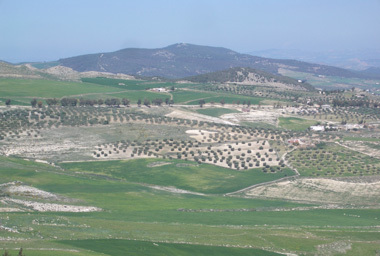 The sprawling traditional hillside village about a half mile up from our hotel was laid back compared to Tunis. The clusters of staring men were usually in 2's and 3's instead of in dozens; the cars and moto's went by 1 at a time; and anyone we approached was welcoming and helpful. We spent a couple of hours walking the neighborhood streets of the village in part to get our exercise and in part to escape our cold, dark, and uninviting room. Back in our room for the evening, the few amenities started to become apparent. Unexpectedly, the air conditioning unit would also kick out heat or dehumidify the room, both services we needed to be comfortable. Covering the gaps around the door and window with masking tape to keep the mosquitoes out made the awkward feeling place more acceptable. And, after spending the evening taking turns reading by the bathroom light while sitting in the only chair, we discovered that there was more lighting available, some indirect fluorescent lights over the window. Unexpectedly, the too soft bed wasn't a disaster for Bill's sensitive back, so the room we'd spend 2 nights in was slowly becoming an asset instead of an obstacle. Still standing: Roman 'Capitole' Temple from 166 ce. Call to prayer wasn't suppressed in Teboursouk as it was in much of Tunis and it did fray our nerves. Our hotel got the jarring collision of 2 or 3 mosques blasting their tape recorded messages out their minarets. It sounded like several off-key howling dogs and was surely unintelligible to any one speaking the language. To us, it was one more seemingly endless sensory intrusion to be repelled. It was no surprise to me when a British retiree making a return trip to Tunisia's archeological sites said "This is the best in Tunisia". Leave it to Map Man to take us to the best. Bill was still in a stew about our Tunisian itinerary and choosing to plan it on the fly had been more difficult than he expected. 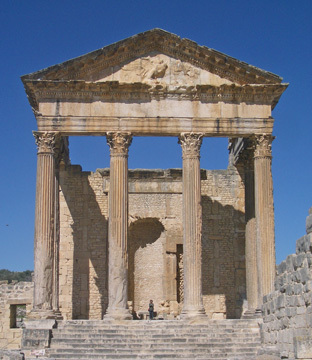 Given that restlessness, it was affirming for him to hear that we were nonetheless skimming the cream of the sites right away with our visits to Carthage and now Dougga. His trip planning struggles instantly lessened as the fellow traveler was quick with his short list of the best sites in Tunisia, some that could only be accessed by renting a car. Unlike him, we'd be limiting our choices to those reachable by public transportation. Reconstructed Numidian mausoleum, 2 c bec. Dougga was indeed an impressive site. The non-grid street plan and a single monument are about all that reveal its origins as a Numidian (Algerian Berbers) city by the 4th century bce; otherwise it is Roman. A half dozen massive Roman temple columns were still standing when documented by visitors in the 1880's. Roman water tanks like the ones we saw at Carthage were still intact as were many barrel-vaulted ceilings of building complexes. Dozens of mosaic floors were still surrounded by the thick stone walls of living quarters though the better floors had been hauled off to the Bardo Museum in Tunis where we saw them a few days earlier. Impressive amounts of Dougga were still standing 1700 years after construction though extensive areas were reconstructed. Our British traveler was a purist and wished they'd left the ruins in the heaps as found but we appreciate a judicious amount of reassembling. The 2nd century bce Libyo-Punic mausoleum from the Numidian era was much more comprehensible with the pieces put back together again than left in the half-height heap that was noted in the 1880's. Many sights we've seen are overly reconstructed and done in a way that lends confusion instead of clarity but we only felt that way about a few buildings in Dougga. 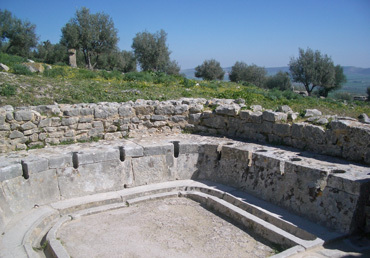 Roman communal latrines at Dougga. In addition to so many ruins that were substantially taller than the usual knee-high rubble, Dougga was impressive for the extent of the ruins. It was easy to guess that most of the layout for the town of 5,000 people was still visible, though we read no such comment. We walked and walked on old Roman roads and pathways between buildings, stood in the middle of many an old room, and pondered the gatherings of hundreds or thousands of people in the numerous expansive civic areas. Ancient doorways in Dougga were still high enough to admire both the track in the paver stone of the old door and cuts in the stone where metal hinges had once been. The small latrine area was neatly reconstructed and several grooved stones that were like the bottoms of olive presses were visible in other rooms. Dougga had a lot to see but wasn't well documented so having learned the details of Roman baths and their household technologies at other sites and museums was a huge help to us. Jendouba was our next stop on our loop of northern Tunisia that started by heading southwest from Tunis. Compared to Teboursouk's village-feel with a population of 13,000, Jendouba didn't offer us all that more with its 45,000 people. 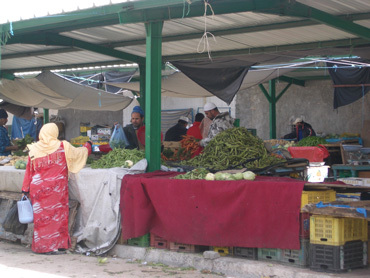 It did have a little supermarket instead of a closet-sized shops but the produce market was shoved off the main corner in town and was harder to find next to the railroad tracks. The town had a friendly buzz but not much substance by our standards. A better than average view out our window. I was delighted however when we were quickly moved to a second room after the hotel clerk had deposited us in our first quarters. Bill had used his broken French to ask for a sunny room in hopes of getting a bit of solar gain to take the chill off what we expected to be an unheated room. Both rooms were an east exposure instead of the south side we'd hoped for. A conference with other staff must have occurred after we were deposited as a group of a half dozen staff watched as we were moved to a corner room with 3 windows. Still not much sun for warmth, but natural light and better views are always welcome. The brightness of the second room had us set to extend our stay to 3 nights instead of the planned 2 but then the evening staff declined to provide us with hot water the second night. We'd been told that the hot water would be on at 7 pm, which it was the first night. But the less eager staff couldn't be coaxed into turning the knob the second night and we suffered through chilly baths in our chilly room. Too bad there was no way to let the management know that that decision had cost them customers in the depths of off season. Jendouba served its purpose however, which was to poise us for day trips to Bulla Regia and Chemtou. These were definitely "B list" sites, but still worth seeing. Bulla Regia is on the tourist circuit because of its well preserved underground Roman homes built to offer relief from the searing summer sun. 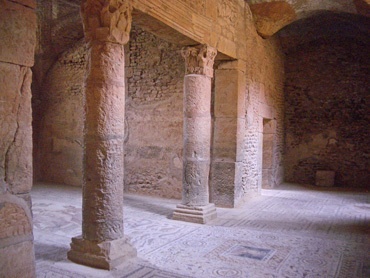 The basement level of several large homes are still intact with their several storey-high ceilings, open-air colonnaded courtyards, and mosaic floors. It appears that these homes also had equal-sized, above ground quarters too. Well preserved underground Roman villa at Bulla Regia. Of course, it wasn't just the Romans who were in Bulla Regia. Carthage had a town here in the 5th century bce, then the Numidians filled in as the Carthaginians scattered after losing the 3rd Punic War to Rome. Bulla Regia peaked under the Romans in the 2rd and 3rd centuries ce and it was later occupied by the Byzantines. Chemtou, our second day-trip site from Jendouba, barely held its position on the "B list." It wasn't all that grand and it was too far off the beaten track for accessing by public transportation. As a consequence, we spent about $30 for round trip taxi service and then were on the driver's schedule instead of our own. This was one of the first times in Tunisia that we really wished we'd either rented a car for a week or had our bikes for getting around. We went to Chemtou as its claim to fame is being the site of the largest ancient quarry in North Africa--a quarry that yielded a highly prized golden colored marble for the Roman export market. But there wasn't all that much to see of the quarry. We were disappointed that it lacked the visible remnants of quarrying activity, like blocks partially but not completely removed. And unfortunately, we didn't find the much extolled museum all that interesting. I would have been better had any of the text been in English but even when we were motivated to translate the French or German exhibits, we didn't find answers to the questions we were asking. 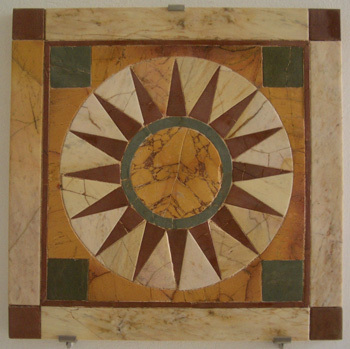 A sample of the golden Chemtou marble at the museum. With Chemtou we began realizing that the cream wasn't deep in Tunisia and that we'd probably already seen the best of the readily accessible archeological sites. Map Man's itinerary was still fluid, so it was time to reassess our tour of Tunisia. We'd come to Tunisia with a joint agenda: to see its ancient archeological sites and to be relatively warm while we traveled in a new land. With 4 ancient sites behind us, it looked like we'd done the fabled "80-20" of the business world: we'd gotten 80% of the goodies from 20% of the effort. 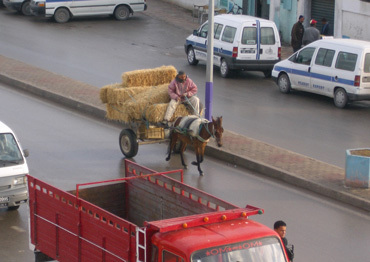 It was time to switch gears and round-out our time in Tunisia with a different cut on the country. Le Kef, another small city of about 45,000 people at 2,600' wouldn't yield much of its Punic, Roman, Vandal, or Byzantine history to us, but its museum would allow a look at a Berber desert tent. Lower elevation Kairouan with its 120,000 people would immerse us in the most sacred city in Tunisia. Then we'd collude with the devil and visit Hammamet, the most popular tourist resort in Tunisia to see what it was about. Lastly, we'd travel due north near the eastern coast to see the ancient Punic city of Kerkouane near Kelibia, then back to Tunis to meet our ferry. That seemed like a more fulfilling strategy than tracking down successively more puny Punic and Roman sites. 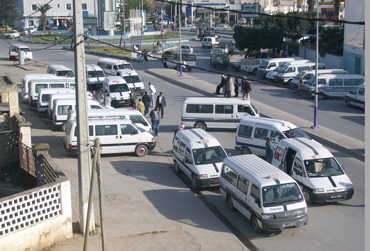 We rode in several of taxis while in Tunisia and some of the drivers had the interiors sealed in plastic. Plastic sheeting was secured to the ceiling, plastic bags wrapped around grab handles, and the seats were covered in plastic. Obviously these guys wanted to decrease the wear and tear on interiors of their newer cars and were less concerned about how it looked in the process. One of many louage stands in Jendouba. When we boarded a louage ('LEW-ahj') in Jendouba to go to Le Kef on our revised itinerary, we didn't think too much of the fresh cardboard on the floor. All of northern Tunisia was either dusty or muddy depending on if it had rained or not and we assumed the cardboard was to control the prevailing nuisance. Wrong, wrong, wrong! We learned the hard way after we pulled our luggage out of the back of the minivan after 2 hours of twisting and turning on the mountain road to Le Kef that the cardboard was a slick trick for managing vomit on the floor. The woman sitting next to Bill in our middle row of seats had the driver pull off the road so she could puke outdoors part way up the mountain. She then instructed one of the 2 men in the front seat with the driver that he was changing seats with her. She looked green most of the rest of the windy way to Le Kef, but kept what was left of her lunch down. Unfortunately for us, the older women in the seat behind us either didn't have time or didn't try to get the driver to stop. Unbeknownst to us, she had discreetly puked on the floor, slightly spraying the ankles of my pants and getting a more substantial strike on my suitcase positioned behind her bench seat. At the destination, the driver who had been gunning it the whole way looked neither ruffled or surprised as he pulled out the top layer of tainted cardboard and pitched it in the parking lot dumpster. Just another day at the office for him. Over the years several friends have commented that 3 weeks of foreign travel is enough--after that, they are ready to be back home. We obviously don't have that experience and instead feel like we are just getting over jet lag and settling-in to more efficient routines after 3 or 4 weeks of travel--it's when the fun really begins. I was certain that the difference wasn't in temperament or curiosity about the world, but what was it? My best guess had always been that the activity of biking was making us more resilient. Perhaps it was the physical outlet biking afforded or the slower overall tempo or the necessarily more gradual transitions, but I wasn't sure. About a week and a half into our 3 week tour of Tunisia without the bikes I began to feel weary. "This is what makes my friends eager to go home" flashed into my mind. I remembered too that Bill was especially weary during our more stressful 3 week tour of Egypt and had been counting down the days until we flew back to Germany. Unfamiliar shopping rituals add to the daily stress of travel. I began to see that a quicker tempo, one of my hypothesized sources of weariness, wasn't depleting us in Tunisia as we spent hours strolling the old towns and casually exploring archeological sites. In Carthage we were even scolded by a ticket taker as our previous entrance time noted on our multiple-site ticket was too many hours ago. We defended ourselves by explaining that we were taking 2 days (and buying 2 sets of tickets) to make the rounds. But though our physical tempo was congenial, we were always operating on the same mental processing channel, we were always in tourist mode. As the weariness deepened as we continued to tour Tunisia, I could feel the round-the-clock sameness of the intensity and demands of bikeless travel build. With this more usual form of travel, the focus and nature of concerns were pretty constant, day after day. Also, the stresses of usual travel are primarily psychological, with no physical release of the tension at hand. Walking and hefting luggage certainly count as physical work, but neither provides a release of physical tension and may instead add to it. The nervous systems of humans were designed for sharply on and off stress, 'flight or fight' responses to usually physical threats. Modern life, like most usual travel modes, doesn't often turn the stress off abruptly and neither usual daily life or usual traveling provide a physical release from the accumulating tension like fighting or 'flighting' provides. There is nothing that usually arises in those activities to invite muscles that have contained and restrained to finally let go with a burst. Like exercise regimes at home, travel by bike provides an intense, physical body outlet for the droning and building psychological stresses of so many things being new and different. Our Tunisia experience underscored for me that the biking aspect of our travels dramatically increases our traveler's endurance. Cyclotouring pulls in the mind in more directions than do most travel modes. Our minds must bounce between monitoring the intricate physical sensations of our bodies triggered by the exertion, reading the more rapidly passing environment for safety and directional information, and contemplating any worthy sights. Instead of the dulling of the mind that happens with the same quality of stimulus as occurred in Tunisia, biking usually gives us much more varied sources and intensities of input. And if the fluctuations in demands is stress producing rather than releasing when biking, we stop and take a break to re-center ourselves. This greater range of stimulus when biking combined with the sharp physical release of tension it affords keeps the weariness factor down when we travel abroad, something we missed in our suitcase-travel of Tunisia. Our experiences in countries like Tunisia, Egypt, and Turkey have also taught us that we get weary when the pleasantness of our environment drops down and stays there. In Tunisia, there was little to see or feel that was comfortable and reassuring, everything around us was always unsettlingly rough. Most of the archeological sites and museums were quite spare. Some of the best displays had been done by foreign universities decades ago and were now faded and fraying. All sites smacked of never having had enough cash to do it right. Sometimes everything is an adventure abroad. The signage at historical sites was woefully lacking and left one guessing as to what you were looking at or where to go next. The infrastructure, like streets, sidewalks, and public transportation, had been built but the maintenance is just sufficient to keep it functioning. We considered it a coup when the toilet in our room would fill for flushing again in less than 20 minutes or we found an electrical outlet that worked. Even in our first 3-star hotel, the bed linens were torn and the bathroom was aged. None of these things were big problems, but the consistently lower standards everywhere you turn do deplete one's energy, they do erode one's sense of well being. We had 2 hotel rooms while in Tunisia in which we felt like we could relax at night. One had a single light bulb in the room but the white walls and ceiling and clear fixture made the room bright and we could read without straining. These 2 more soothing rooms were where the hot water was hot, the heating allowed us to shed several outer layers of clothing and be comfortable sitting, and the second hand cigarette smoke wasn't sickening. Only in these 2 rooms did we feel like we could let our guard down enough to get lost in our reading. Here we didn't have to keep moving to stay warm, we weren't confined to our beds for lack of floor space, and it felt clean enough to unfurl our tense muscles. Tunisia and Egypt were especially taxing because we rarely could relax indoors or out. Being without our bikes in both nations limited our access to the countryside, so our days were spent in more urban spaces. But the urban spaces weren't pleasant--interesting--but not pleasant. In Tunisia, unlike Egypt, we often found urban parks to sit in for our lunches, but there was nothing serene about them. We'd shop around for a bench that lacked the strong odor of urine and where the surrounding piles of garbage weren't too thick. 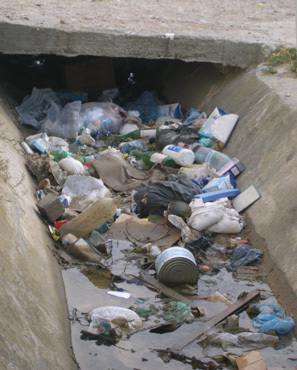 (I imagined that the locals thought we were wimps because we packed up our garbage instead of tossing it behind us.) We wouldn't be casting our eyes onto lovely foliage in the parks but instead looking at a scene of dead or dying landscaping. We enjoyed the rest that a place to sit afforded but the experience lacked the soothing quality of many of our countryside picnics that usually make lunchtime a high point of the day. We didn't dine in restaurants or take a break in cafes but few that we saw would have invited us to drop our guard. Scenery that creates tension rather than calm. Turkey was different. It too suffers from the lack of refinement common among developing nations but we had our bikes both times there. We had more choices of where to pause to rest during the day. We didn't need a bench to lift us out of the garbage and we would be content to sit on the earth or a rock on a knoll in the countryside. Our greater mobility put us more in charge in Turkey and most days we could hold out for a pleasing ambiance for our rest stops and lunch. The peaceful interludes during the day fortified us so that we had more resiliency for the often less than pleasant or odd rooms at night. Our experience in Tunisia was suggesting that to keep our endurance and resiliency high for non-biking foreign travel in developing nations that we needed to luxuriate (perhaps linger an extra day) when we found a town or hotel that was pleasant and that we needed to be more aggressive about creating physical energy outlets for accumulating psychological tension. We are still in Sicily experiencing far less traveler's stress than when in Tunisia. Once again we discovered that we felt settled-in rather than more stressed at the 3 week point in our bike trip. The muscles had re-acclimated to the challenges; the over-stuffed panniers had settled and had gottn easier to close; the problems created by new gear were getting resolved; and we felt at ease with the daily rhythms. After 3 weeks on the road, we could kick-back and enjoy the process rather than be distracted by the mechanics of it all. Now we could savor the sights and sounds of our hours outdoors in a constantly changing landscape. Now our minds were at ease, open, and receptive to what was new around us. We've just returned to the Sicilian 'mainland' after spending a week in the Aeolian Islands, which are politically a part of Sicily. Bill had one of his lung-grabbing colds, so our visit to the islands was less active than anticipated. We are now dodging what we expect to be 10 days to 2 weeks of lodging scarcity from the back-to-back one day holidays of Liberation Day and May Day. We are avoiding the lodging crunch at the seashore villages by being in Messina, a city of over 300,000 during the Liberation Day holiday. We'll head out on Monday to ride a few days, then park again until the May Day mayhem settles down. Visiting Mt Etna is the next big event on the horizon.